After completing work on the unreleased ATG and doing work for BMX Kidz, Paul Docherty was assigned to another Telecomsoft based title, this time a cheeky Super Mario Bros clone called Crucial Bros which was to be released by Silverbird back in around 1988. The game was being developed by John Knox, who previously had been working on another game for Firebird called "Food Feud". 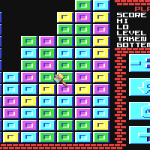 It is believed that the game was actually completed, or at least very close to that stage. But sadly at the death it was considered to derivative to market and it was cancelled, never to see the light of day. Dokk recalls that the game was fun to do, which indicates that this could well have been a great looking game. As for how it played, we’re not too sure. John Knox has been problematic in trying to find, and we are still yet to locate him to discuss Food Feud. Add this Mario Bros clone to the list then!